MOSCOW, Russia -- In Russia and Ukraine, homeless animals are destroyed with the use of curare-like paralyzing poisons. Ditiline is forbidden in Ukraine, but the drug is widely used anyway. Ukrainian animal rights activists no longer seek understanding and support from the government and say that they are ready to take extreme measures: they threaten to disrupt Euro 2012 football championship in the country. Russian animal rights activists wage their own war for homeless four-legged creatures. On February 2, 2020, 500 people filed a written protest against the return of useless and barbaric extermination of homeless animals. 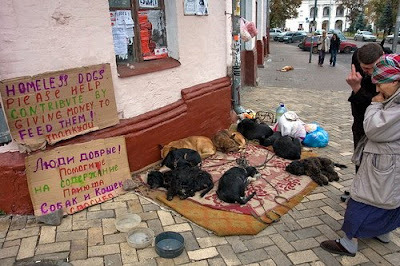 Yuri Luzhkov, Moscow's former mayor, stated in May of 2008 that he was supporting humane policies towards the regulation of the number of homeless animals. However, reality proved that the verbal statement entailed no action: animals would be captured in the streets and sent to unfinished shelters, where they would die because of poor housing conditions. The same year, Luzhkov's deputy Pavel Biryukov offered to replace the program of sterilization of homeless animals to their extermination in municipal shelters. The black list included quarantined and sterilized dogs. Animal rights activists said that such a change in the law would only legalize animal slaughter. In Russia, homeless dogs are also destroyed with curare-like drugs such as ditiline and its derivatives. Curare-like paralyzing poisons are banned in the whole civilized world, and their use is categorized as brutal animal abuse. Many in Russia believe that a large number of homeless animals is a result of uncontrollable breeding of purebred dogs and cats and the absence of propaganda to sterilize homeless pets. In addition, taking homeless pets from dog pounds is not considered a traditional practice in Russia. There is direct connection between the cultural and moral level of the society and the attention that it pays to issues of protection of animals. The culture of eating dog meat has been prospering in Moscow lately. A journalistic investigation conducted by one of Russian TV channels revealed a whole chain of restaurants serving dog meat in the south-west of Moscow. The attitude of the Russian Orthodox Church to four-legged creatures is terrible too. On October 27, 2007, a priest of Russia's iconic Trinity Lavra of St. Sergius ordered to pack over 30 cats in sacks and take them to a landfill where they were bulldozed. During the festival of balloons held in Moscow's Tushino in 2008, several lambs were publicly slaughtered for meat. The festival was conducted with the blessing of the Patriarch of Moscow and All Russia. In 2007, a priest of the Temple of St. Matrona in Moscow's center ordered a security guard to beat a puppy who ran onto the territory of the church. The guard broke the puppy's spine. Atrocious attitude to animals prospers in Ukraine too. Ukrainian animal rights activists won the support of UEFA after their numerous attempts to reach the national authorities had been left without attention. In Ukraine, homeless animals are destroyed barbarically. Dog catchers use special syringe guns to kill homeless pets. The poison that they used is called ditiline - a drug that paralyzes respiratory muscles. "Animals stay conscience during the process. Ditiline literally breaks their lungs into pieces during several hours, and dogs die in unimaginable pains. Animals are being destroyed in public while other people including children are watching," an activist said. "It is possible to solve the problem with homeless animals, but it will take time. Destroying animals is not a way out, because other homeless dogs and cats breed very fast. To reduce their growing number, one should eliminate their sources of food - garbage containers in the streets that do not get emptied as often as they should. If animals have no food sources, their number will be cut considerably in a natural way. In Ukraine's Lisichansk, local authorities purchased a mobile crematorium for 198,000 hryvnas. It looks like a field kitchen with a chimney. The crematorium is operated by a driver, an operator and a catcher "armed" with a syringe gun. They paralyze animals and throw them into the container. As soon as they collect 40 kilos, they burn the paralyzed dogs and cats while they are still alive. Last year, the Ukrainian president, the prime minister and the opposition leader received dozens of letters from foreign animal rights activities, who urged them to immediately stop the uncontrollable and brutal extermination of homeless animals. Activists from other countries sent many similar messages to UEFA headquarters because Ukraine is hosting Euro 2012 football championship. Europe is ready to boycott Euro 2012 in Ukraine. Activists, with famous people among them, are ready to organize meetings of protest near Ukrainian embassies in EU countries if nothing changes for the better. Director of Euro 2012, Martin Cullen, told Ukrainian officials that he condemned barbaric methods of solving the problem with homeless pets. The official stated that the government of Ukraine should take the problem under control because the brutal methods used against the animals contradict to European norms.